Appearance: ( 8 ) A muted green and orange color palette that vaguely reminded us of the 1970’s. We like the 1970’s. Quality of Ingredients: ( 9 ) Once again, the salsa stole the show. The tomatillos in the salsa were cut into sizeable chunks that added a delightful tartness, working well with the sweet potatoes. The frisee added another layer of tart freshness. A sweet potato soup was used as the sauce in these nachos, and while it would have been delicious on its own, combined with the roasted sweet potato chunks it was just a little too sweet. Hankering for a little more zest, we made liberal use of the Cholula bottle and the chopped jalapeno and poblano chilies that our ever-accomodating waitress, Laura, brought to the table. 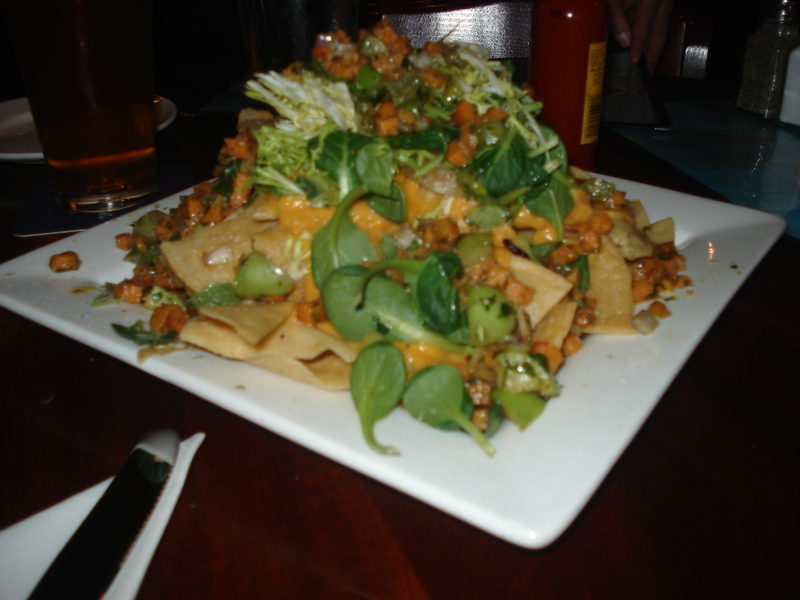 The cheese, when we finally found it, was the missing link that these nachos needed. Distribution of Toppings: ( 7 ) Everything was wonderfully arrayed, but for the cheese. There was very little of it and it was all in one slab in the center of the nachos. We would have loved more crumbles to add a little more savory.